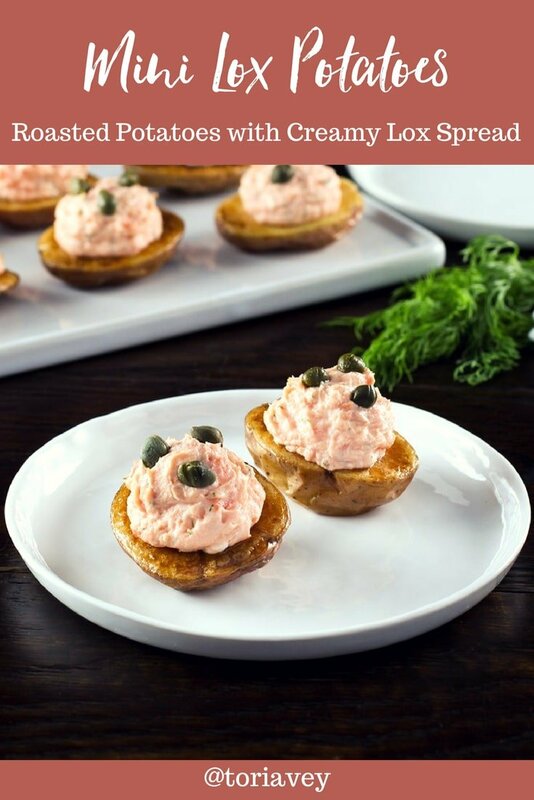 Top roasted baby potatoes with a luscious salmon lox spread made with cream cheese. Add some Greek yogurt to lighten things up. 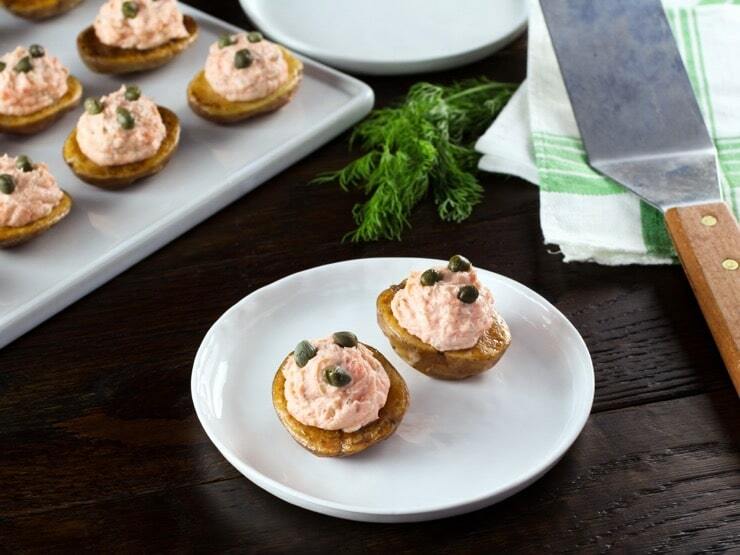 Pop in some fresh dill for flavor, and top it all off with capers… what do you get? My Mini Lox Potato appetizer! Lox and cream cheese is a classic Jewish flavor combination. Luscious, salty salmon topped with a schmear of whipped cream cheese is somehow just perfect together. Sandwiched between two bagel halves, there is nothing more satisfying on a Sunday morning. 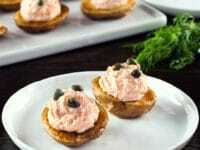 This appetizer will allow you to enjoy lox and cream cheese as a lightened up, gluten free appetizer. 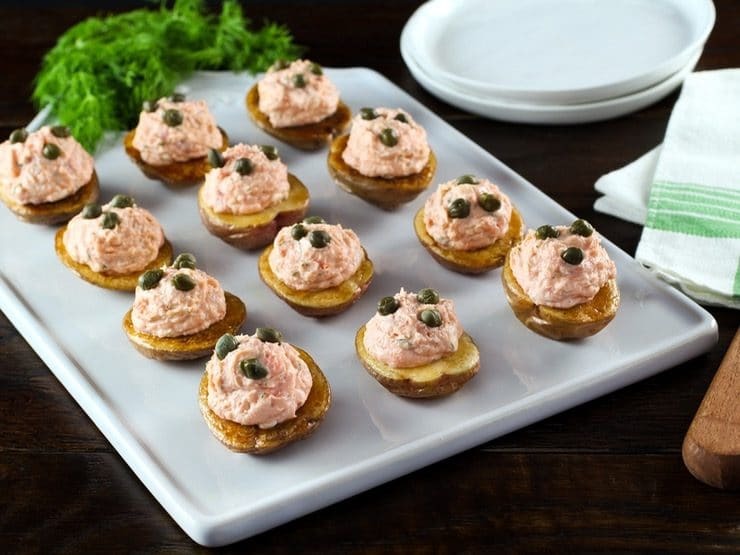 Roasted baby potatoes create little “boats” for a luscious lox spread. Greek yogurt lends nonfat creaminess to the lox; combined with a small amount of cream cheese, the flavor is rich and creamy without being overly caloric. You can use either smoked salmon or cured gravlax for the spread, both are equally delish. Topped with capers, the flavor is heavenly. 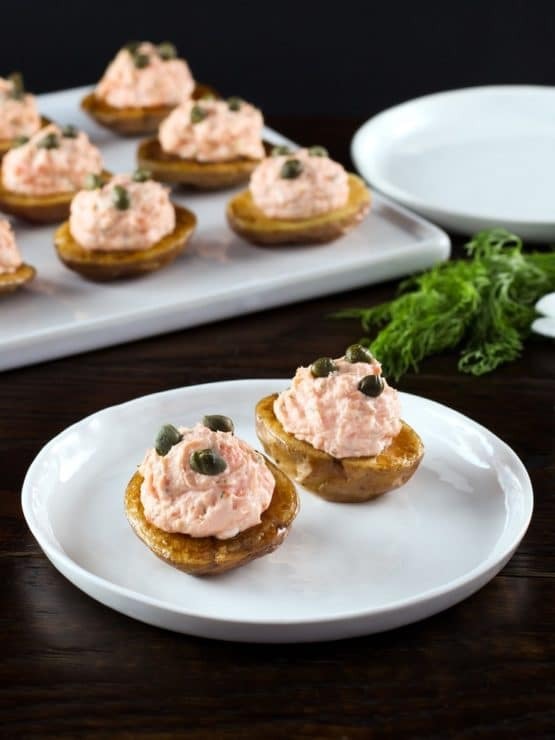 In addition to this baby potato appetizer, the lox spread goes great on whole grain toast, as a topping for crostini, or the old school way… on a toasted everything bagel. Essen! Makes roughly 40 mini potato halves. Preheat the oven to 400 degrees F. Scrub the potatoes clean, leaving the skin intact. Slice the potatoes in half horizontally. 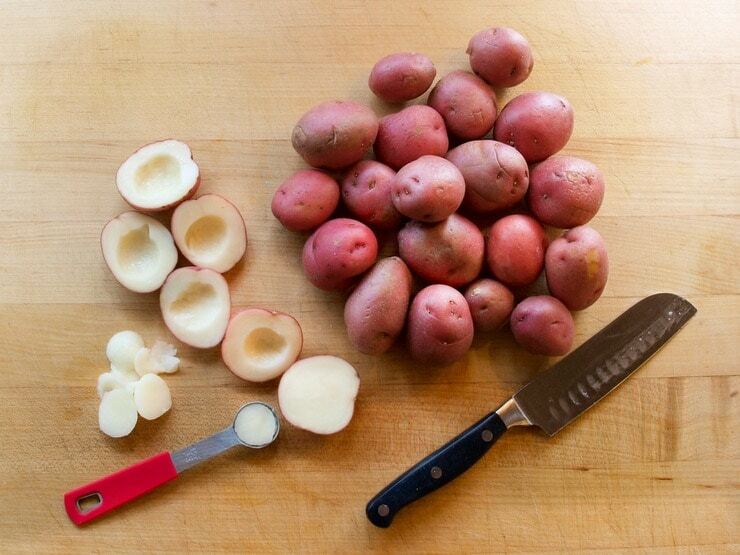 Use a vegetable corer or melon baller to scoop out a teaspoon-sized hole in the center of the cut side of each potato half. Place halved potatoes into a large bowl and discard the cored pieces. 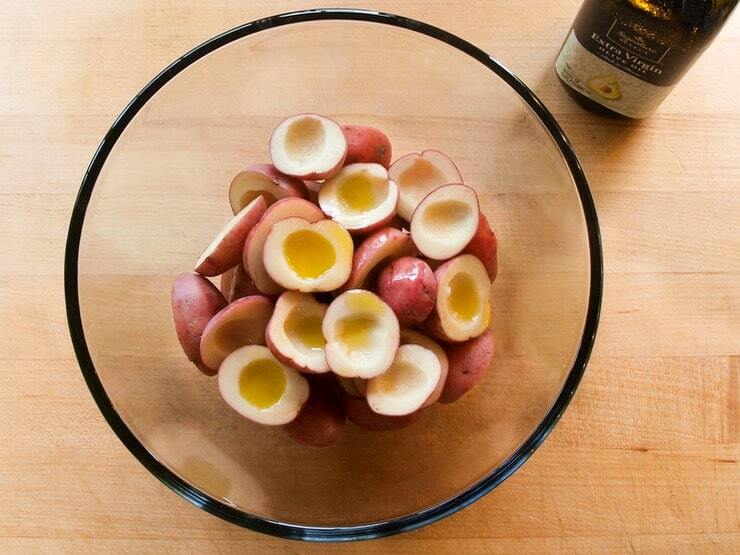 Toss the potato halves with 1 ½ tbsp olive oil until evenly coated. Brush the baking sheet with the remaining 1 tbsp of olive oil. Put the potatoes onto the baking sheet, cut side down, skin side up. Roast the potatoes for about 30 minutes until tender. Let the potatoes cool to room temperature. 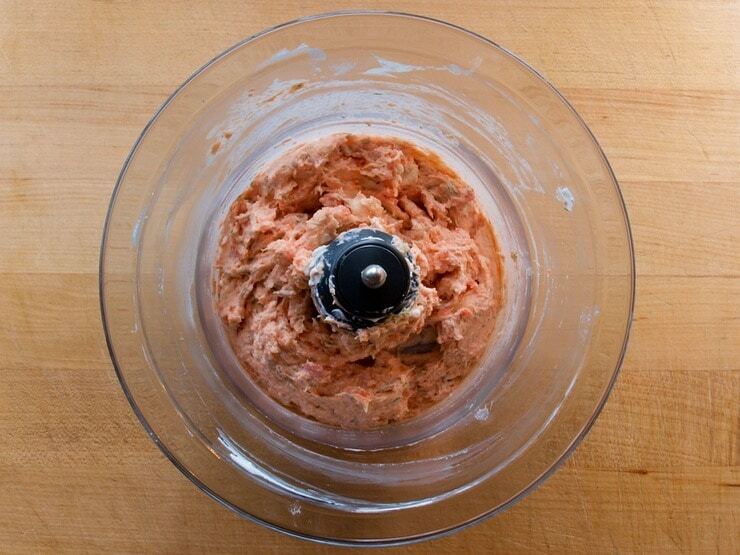 Meanwhile put Greek yogurt, cream cheese, lox, and dill into the food processor. 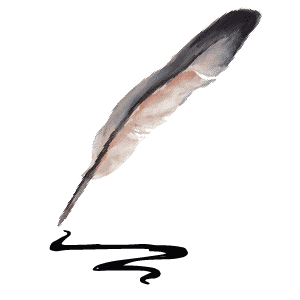 Process ingredients until they are blended together. When potatoes are cool, use a small spoon to fill the hollowed out potato halves with the lox mixture. Garnish each potato half with 2-3 capers. Serve. 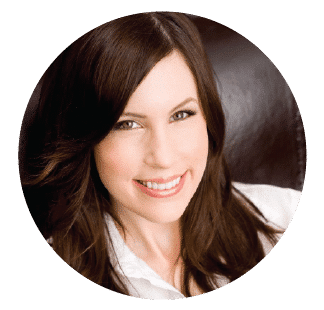 Make Ahead: I'm not a huge fan of refrigerating potatoes (they can sometimes turn mealy), so if you want to make this ahead I recommend making the spread in advance and spreading it on crackers or bagel chips. Still delish, and your prep time will be cut down considerably. Enjoy! Made this for a New Year’s Eve party last night and it was a huge hit! 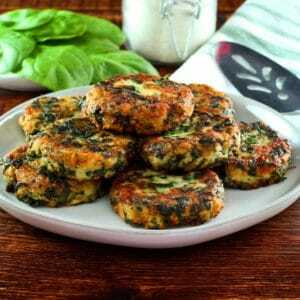 But I took a shortcut and instead of roasting potatoes, I used frozen mini latkes – delicious and quick! I just bought a really big pkg.of lox and will try that stuffed mini potato recipe, sounds yummy! Hi Iris, I have a Smoked Whitefish Salad that is one of my fave things ever! https://toriavey.com/toris-kitchen/whitefish-salad/ Not sure how to make it less salty, I think the saltiness is part of the appeal… but mixing it in a salad this way with other ingredients will cut down on the salt a bit per serving, I think. Enjoy! I bet you can thinly slice, oil and roast nearly any potato , let it cool and then use this as a topping. Fingerling potatoes would work as well since they are small. Larger potatoes might have to be cut into smaller pieces and served with a toothpick. 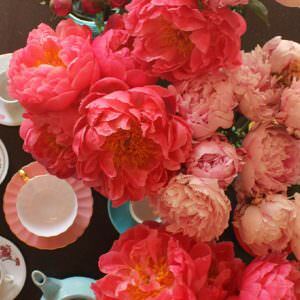 I could eat 2 or 3 hundred of those! They look super easy to make also. Oh my goodness! I think I’m in love. I want to add a tiny sliver of red bell pepper in a smile.